Tech is something that exists on a global scale, a community of people and companies that work together to create unbelievable things. It doesn’t take into account nationality, ethnicity or borders. Working in tech is like being part of an international family at all times. It doesn’t really matter where you are in the world, you’re probably going to collaborate with someone from another part of the world. I work for a software development company, an outsourcing company that has clients from all over the world. We work with them and their own tech teams, bound together by a similar language, in code, be it Perl, Java, PHP or just plain old English. Outsourcing software development services is a common practice for many businesses, related to costs, talent availability or specific skills. Good software developers don’t grow on trees (if they would, we’d plant a field of them) and getting the right people on your project is not always easy. We had clients for Perl development for example, that couldn’t find the right people (or enough people) on location so they went to a third party. Not everybody is comfortable with working remotely, but those who are, are looking at outsourcing options. When it comes to outsourcing, Eastern Europe and Asia make up the most common choices for western companies with a few countries from South America also coming up on the list. A.T. Kearney Global Services Location Index tracks the evolution of the offshoring landscape in 55 countries across three major categories: financial attractiveness (grey), people skills and availability (blue), and business environment (red). Based on 38 metrics they identify the countries with the greatest potential to deliver information technology (IT), business process outsourcing (BPO) and voice services. I have to mention that the latter — voice services, is something completely different from the main point of this articles, which is specific to outsourcing as software development. 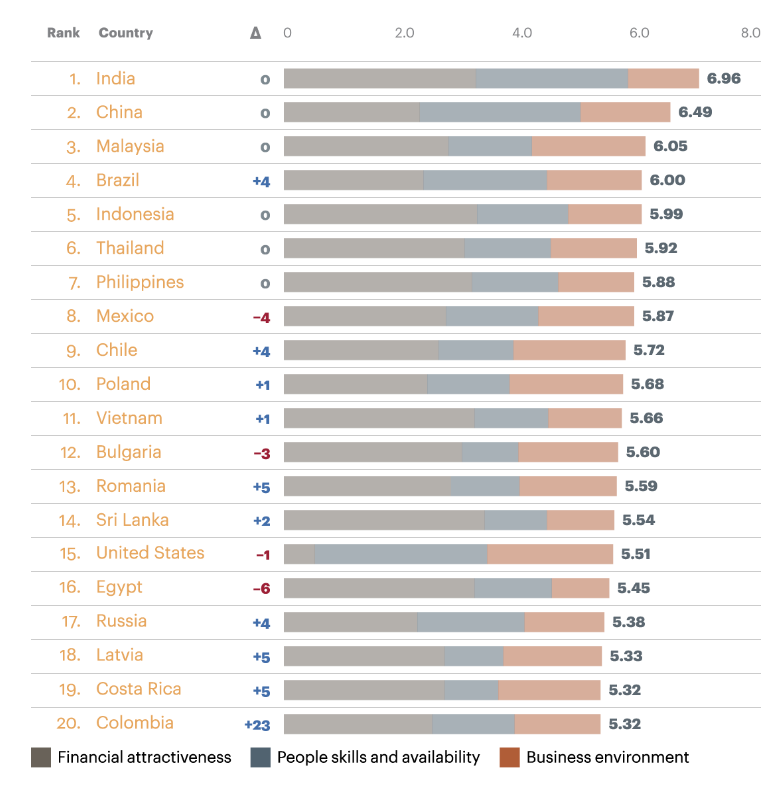 There’s no surprise that India tops the chart, since it’s a huge outsourcing provider and also a very populated country with a thriving workforce. Our main headquarters is in Romania, which has risen 5 positions, to no. 13, from the previous study conducted in 2014. The outsourcing industry here focuses more on BPO and IT related business and less on voice services. India, mostly Bangalore, dubbed the Indian Silicon Valley, is the leading IT exporter and the second fastest growing major metropolis in India. Its population has doubled over the last 15 years due to the increase in the outsourcing field, it’s home to countless outsourcing companies that provide a vast array of services related to technology development. Besides tech, India is the former world capital of call centers, overtaken by the Philippines in 2015, which also has a boosting outsourcing industry that has revitalised its economy in recent years. The Philippines are second only to India when it comes to global outsourcing, but they slip in the software development department, focusing more on BPO activities. Since 2014 they gained ground in fields like infrastructure, environment, and tax and regulatory costs proving to be a more attractive location for western companies. When it comes to Asian countries and outsourcing software development, India remains the most obvious and popular choice. Bangalore even has a startup culture brewing, with Startup Warehouse, a government funded incubator for startups. Their goal is to have 10.000 startups in 10 years, a noble initiative meant to push India beyond the service sector into a more self sustained software development economy. But this is just a drop in the ocean, as the software development/ product development industry in India has a lot of catching up to do. There is a massive number of developers in India and most of them have a very different upbringing and lifestyle from western or even eastern european programmers. Their code quality can be questioned at times (with exceptions of course) but at one point you have to stop looking for the silver lining and realise that this is what the Indian tech environment provides right now. Some may break out and be able to create awesome products, maybe even better than a western team, but in a country where millions are getting in the outsourcing business, how likely it is that they’ll stand out or that you’ll be able to find them? They seem to be working in a system where getting a task done is more important than how it is done and why it is done. This in large is caused by their outdated and overwhelmed higher education system that teaches more to memorize than to actually learn. This systematic workflow can be very damaging to software development. Vasu Kulkarni is an entrepreneur from India, educated at the University of Pennsylvania. He also points out that a major set back for Indian developer is the way they’ve been trained at the university level. But that doesn’t mean that the only bad developers you’ll find are Indian or that all Indian developers are bad at what they do. Each country has their own share of them, including the U.S. or the U.K., countries that tap into outsourcing the most. Eastern European countries don’t have the labour force available in most Asian countries, but they provide a more cultural comfortable and time zone friendly environment for Western European countries and even the U.S. It goes without saying that these are not the only merits that make Eastern Europe an attractive location for companies looking for outsourcing software development or BPO. Countries like Romania, Bulgaria, Poland, Ukraine or Latvia attract British companies and not just, because of a more involved capacity, where the outsourcing company acts more than just a provider of services, it also has a proactive role in the clients business development. This is a big difference between (some) outsourcing companies in Europe and Asia. We at Evozon try to help our clients as much as possible, working together in a partnership to always find the right solution, be it code related, testing or business analysis. We’re more than just service providers and I think this reflects a bit (at least) in the Cluj Napoca outsourcing environment. In Poland the business service sector has several industry centers and a large number of Poles who have worked overseas and are more adapted to the customer and the language. 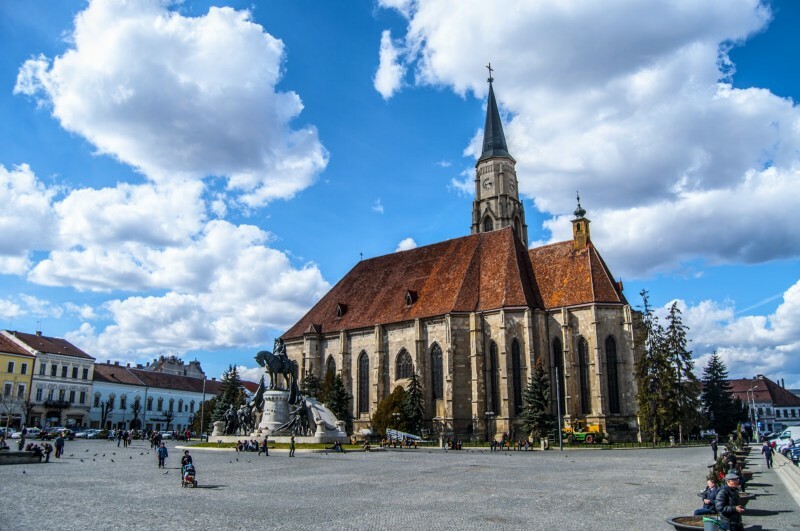 In Romania the largest cities have a thriving IT sector, with Cluj Napoca, Timisoara and Bucharest standing out on the outsourcing scene. Romania has lower labour costs than Poland and with more than 60.000 people working in the outsourcing business, there is plenty of good talent to go around. As an outsourcing company covering languages like Perl, Java, PHP, .Net in an university city with hundreds of graduates each year, we have to scramble to recruit the best, from the very start, as competition is high. Ukraine, Latvia, Russia also have IT centers working on outsourcing. The fact that some of the countries in Eastern Europe are part of the European Union provides other advantages appreciated by some companies. Outsourcing in this case would more correctly be referred to as nearshoring, as the more close location provides another set of benefits, including a closer timezone and a lack of a cultural barrier. The education system in Romania, and in Cluj Napoca more specifically, produces a large force of qualified developers that have the technical skills and independence to deliver a good product. Most countries in Eastern Europe are seen as less risky when it comes to outsourcing software development projects. They also provide a great opportunity to tap into a pool of highly qualified individuals, at lower costs, at a nearby location. The main comparison point here is on software development, as outsourcing encompasses many services and practices. Although many companies here in Cluj and in Romania cover all of them, from the mentioned software development to call centers, we want to focus specifically on a choice for a development team in Eastern Europe and one in Asia. With the risk of being too broad and a bit biased, programmers in Eastern Europe tend to be more proactive, focused on solutions not just on completing specific tasks. There are bad and good experiences in outsourcing and it’s easy to dismiss something because of them, but the fact is there are many differences in mentality when it comes to developers, brought on by education, local and organizational culture. Asian companies tend to be more compliant to clients and just do the tasks that they’re assigned to. We had a few situations when we worked with Indian outsourcing companies through third parties and the outcome was quite mixed. There are without a doubt very good people working in outsourcing companies in India, but there is also a huge difference, and I dare call it, problem as well. The cultural divide that exists between India and the western world, and the differences that exist in India between the various castes make it more difficult to work in a homogenous environment. This divide reflects mostly in the communication between the client and the outsourcing team and more than that, in between the development team itself. 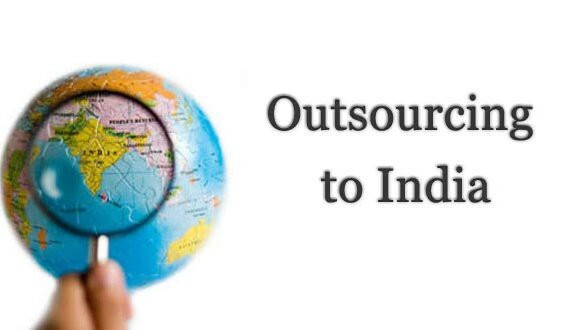 There are companies in India that overcome this and there are teams that work together just like any European or American team, but in a country synonymous with outsourcing with a huge workforce and countless outsourcing companies these issues will be present. 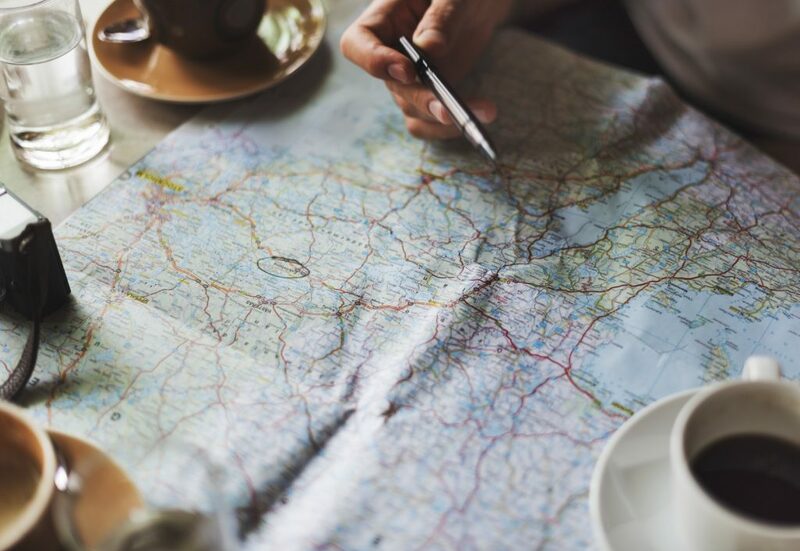 This divide also exists here in Romania, from region to region, but it has less of an impact on results and it brings a far smaller issue when working with clients. A few years back we worked on a project made in India. We did two months of coaching for the team there and 10 months later we were back there trying to fix the issues ourselves. This was a bad situation, for a complex project that went beyond what the Indian team could accomplish. The differences between Eastern European companies and Indian, Chinese or Philippinese companies go beyond the country culture, they reflect in the way companies work and how their employees value their own input and growth. It would be unfair to label all of them the same way. When it comes to choosing between India (other Asian countries) and Eastern Europe for general outsourcing services, including call centers, there’s not much of a difference. But when it comes to building something more creative and dynamic, the divide begins. The client relationship is also a huge factor. You need to have a good and strong relationship between the outsourcing company and the client to be able to create good software. An amazing product is built by people, not by money and those people have to build an attachment to the project, they have to “own” it, feel responsible for it in order to invest quality work. Again, in no way does this define the entire outsourcing spectrum in Asia, but it does gives a glimpse of the situations that can be encountered. There are bad apples on both sides of the pond. No, I will not say that Eastern Europe is a better choice and that you should look at us first when it comes to outsourcing. There are clear advantages in choosing an outsourcing company in Eastern Europe, but the same could be said about India, or any other Asian country. The differences start at the type of work you have and what are you most interested in. Do you want someone more accessible, in a closer timezone with high skilled labourers for complex and intriguing projects? Then your answer very might be Eastern Europe. If you want cheaper labour, if you have simple and routine processes, if you need providers that can offer massive scale out, that Eastern Europe cannot provide, then India might be the answer. There’s a big difference between building a software product and IT services. It also depends a lot on the company you choose to work with, the outsourcing climate has its influence, but it only goes so far. Actually most companies/clients don’t have to choose between the two regions, they can use both of them for certain things. It’s wrong to generalise, but I would say that each region is suitable for a certain type of work, India is more of a cost-efficient service solution that can provide massive teams and Europe is more of a partnership, more engaging and challenging solution for clients. Even Indian companies, like MphasiS expanded into Eastern Europe for a more comprehensive solution for clients. Their base in Poland offers them the advantage of nearshoring sought after by many British companies. India continues to rise on the outsourcing spectrum, dominating the market, but it has a long road ahead before it can lose the image of the cheap labour — cheap solution that has been embedded, especially in the United States. The organizational company culture, the pool of high skilled labourer and the country culture itself are all factors that can make or break a software development team. Too many people look at outsourcing software development solution through just one factor, cost. You might as well have a very low cost solution done on time, but it’s highly unlikely that solution will be made to exact specification. Good and skilled people aren’t cheap, that is as true for the client of it is for the outsourcing company. There are more choices in Asia, as the workforce itself is far greater, but the pool of software developers in Eastern Europe benefit from good structure and high quality education in mathematics and software. The industry here has changed a lot in the last few years, going from a cost effective solution for foreign companies to a more quality focused, even innovative practice. It’s gone from “do as the client asked” to “let’s find the best solution for the client”. Striving for more independence brings more freedom to be creative and build something beyond the norm. Sometimes we found ourselves forced to contradict our own clients, because their proposed solution wasn’t the best way to go. And that difficult conversation is something not very common for Asian outsourcing companies. The general acceptance of their position as service providers conflicts with the nature of complex and dynamic software solutions, which requires communication on all levels, going both ways, occasional changes and judgement calls. We might disagree with you, but we’ll always back it up and try to work together to find the best solution for your business goals. That’s the outsourcing approach for Evozon, working with the client, not just for the client and that’s a pretty common theme for a lot of companies in Romania and Eastern Europe.